In November 2016, 41 Tibetans seeking political asylum in India have been detained by Nepali police when they tried to cross the border to India. The refugees arrested are among the growing number of Tibetans who feel the negative impact of an economic rapprochement between China and Nepal. China’s Communist Party exerts intense pressure on the small Himalayan nation to impede the flow of refugees from Tibet to India – a strategy which has already led to a considerable decrease of refugees daring to undertake what is an arduous journey across treacherous mountain passes. Nepali police have detained 41 Tibetans trying to cross the border into India, officials said on Tuesday [15 November 2016], in a crackdown on people fleeing the disputed region where opposition to Chinese control persists. The detention comes as China strengthens its foothold in Nepal, rapidly building roads and hospitals while becoming a major aid donor and trading partner to the Himalayan nation. Fewer than 200 Tibetans arrived in 2013, trekking for days to cross treacherous mountainous passes to reach Nepal before seeking political asylum in India - down from an annual average of 2,000 before 2008. Human rights groups such as Human Rights Watch say Nepal faces intense Chinese pressure to limit the flow of Tibetans crossing the border and restrictions have helped stem the number of those fleeing Tibet. Police officer Rajendra Bista said the Tibetans were stopped on Monday [14 November 2016] at Dhangadi, 430 km (270 miles) southwest of Kathmandu as they traveled on a bus to India where the Tibetan spiritual leader, the Dalai Lama, lives in exile. "They did not possess passports nor had they any other travel documents," Bista told the Thomson Reuters Foundation by phone from Dhangadi. "We have taken them into custody and handed (them) over to immigration authorities." Basudev Ghimire, director at the Immigration Department in Kathmandu, said the refugees, including Buddhist nuns and monks, were being brought back to the Nepali capital where an investigation would be conducted on how they had entered Nepal. "If they are genuine refugees they may be handed over to the United Nations High Commissioner for Refugees. Otherwise they may be deported to the country they came from," said Ghimire. Officials from the Chinese embassy in Kathmandu were not immediately available for comment. Nepal is home to more than 20,000 Tibetans - many who fled after an abortive uprising against Chinese rule in 1959. Beijing describes the incorporation of Tibet into its territory in 1951 as a "peaceful liberation". It says it has brought development to what was a backward region, and regards the Dalai Lama as a separatist. 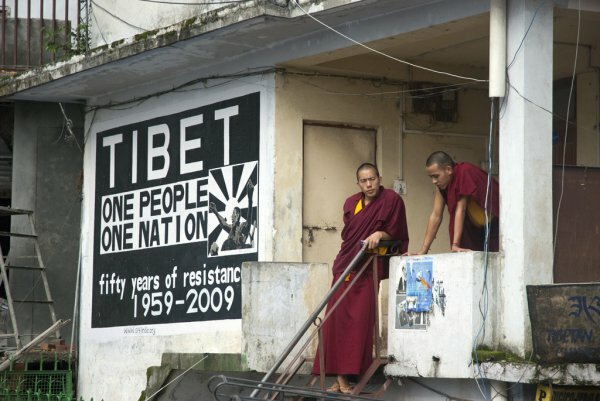 Approximately 128,000 Tibetans live in exile around the world - according to an estimate based on a 2009 census by the Central Tibetan Administration, a body based in Dharamsala, India. Other estimates have placed the number higher. Tibetans accuse China of eroding their Buddhist culture and flooding the region with ethnic Han Chinese. Many Tibetans in exile have fought for a greater say within China, but Beijing says the region already has autonomy and that the exiled groups are trying to split the country.